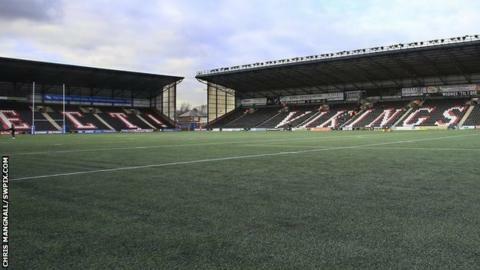 A consortium's takeover of seven-time Challenge Cup winners Widnes has been approved by the Rugby Football League. Sunday's home fixture with Featherstone Rovers is now expected to go ahead. However, the Championship club will still receive a 12-point penalty for going into administration. An RFL statement confirmed: "The board have granted RFL membership to the consortium who agreed a deal to take over the club with the administrators earlier this week." Widnes were placed in administration last week, prompting the postponement of last weekend's game against Sheffield Eagles for insurance reasons. Fans began a fundraising campaign which has raised more than £100,000 in support of the club - and the seven-strong consortium of Chris Price, Jason Shaw, Roger Harrison, Stuart Murphy, David Dean, Tracey Glendinning, and Rod Steele is now in place. The new private limited company, Widnes Rugby League Club Limited, has already been registered with Companies House. Shaw's presence on the board means Widnes supporters group Vikings Quids In, who have been a major part of the fundraising drive, have representation at boardroom level. The 12-point deduction, under the RFL's insolvency rules, leaves the Vikings, who had won their first two matches of the season prior to losing heavily in Toronto, on minus eight points. Widnes are one of the most recognisable names in English rugby league. The Chemics enjoyed their most successful era in the 1970s and 1980s, winning three league championships, four of their Challenge Cups and the World Club Challenge, in 1989. Among their stars were Martin Offiah - who left the club to join Wigan for a then record £440,000 - Andy Gregory, Joe Lydon, who both also moved to Wigan, Tony Myler and Kurt Sorensen. But, after selling their Naughton Park home to Halton Borough Council, they fell on hard times following relegation from Super League in 2005 and went into administration two years later, before being taken over by local businessman Steve O'Connor. The Vikings returned to the top flight under the licensing system in 2012 but did not finish any higher than seventh during their most recent spell in Super League before being relegated last year.